Address pain or injuries that have been holding you back? Gain an increased awareness of what is happening in your body? Pursue a path of deeper healing through embodiment? Whatever your goal, Molly would like to help you get there! As a longtime athlete, yogi, runner and seeker, Molly knows firsthand the many benefits of bodywork. She believes that as we start to take care of ourselves and work toward optimal health, we become more present physically and beyond, and we become open to all the possibilities that life offers us. Reiki sessions and sessions that combine both techniques. Molly offers individualized massage sessions to help release stress and pain in the body based upon your condition and goals. Reiki is an energy healing practice that supports overall balance, reduces stress and pain and supports the immune system. Reiki supports physical, emotional, mental and spiritual health. Molly works with each of her clients to support them as they work toward their wellness, healing and fitness goals. She offers massage therapy sessions, Reiki sessions, and sessions that combine both techniques from her Reiki studio in Andersonville. Not sure what you want or need? Just ask! Molly places an emphasis on discovering what type of massage works best with each and every individual. Check out what people are saying. An NCBTMB board certified Licensed Massage Therapist who specializes in therapeutic massage and Reiki, Molly completed her massage training at the Soma Institute and is a certified Reiki Master Teacher. She is also a certified Forrest yoga teacher. Molly’s office is located in Chicago’s Andersonville neighborhood and has ample (and free!) street parking. in a number of reputable media, online and offline. 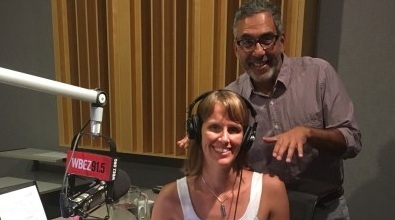 Molly was recently on WBEZ’s “The Morning Shift” with host, Tony Sarabia, to talk about her massage & Reiki experience and practice. Listen to the full audio. Molly has provided Reiki mini-sessions at outreach events around Chicago. Check out this video to hear what people have to say after just a few minutes of Reiki!